The widest binaries and triple systems have very elongated orbits, so the stars spend most of their time far apart. But once in every orbital revolution they are at their closest approach. Pairs of stars with separations five hundred times the size of the solar system could be triplets in disguise. 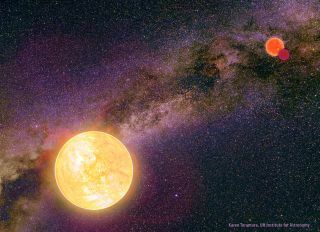 New research indicates that many of the known wide binaries (double star systems) may have once contained three stars, and many could still harbor a third. Bound together by gravity, binary stars make a large percentage of the universe. While most are close, some pairs can orbit with separations thousands of times larger than the distance between the Earth and the sun, known as an astronomical unit. But the wide spread between the two stars means that they couldn't have formed in the same cloud of dust and gas, leaving astronomers to puzzle over how they formed. "This has been a long-time mystery about these very wide binaries," Bo Reipurth, of the University of Hawaii at Manoa, told SPACE.com. Scientists estimate that as many as 10 percent of stars in the universe are part of wide binaries. Close examination of many of these pairs can sometimes reveal that the central body is not one but two closely orbiting stars, making some wonder just how common such triple systems are. Working with Seppo Mikkola of Finland's University of Turku, Reipurth proposed that three stars within a cloud of molecular gas and dust are gravitationally bound together soon after formation. The group starts their lives close together, but interactions between the three eventually result in one of the stars being hurled from the group. A strong enough push could remove the star from the system completely, but a weaker one results in a distant orbit. Sometimes the system may last for tens of thousands of centuries before losing the distant star; other times, it may stabilize enough to last billions of years. The energetic kick that pushes the third star out also drives the two remaining stars together in a close binary. If the ejection comes while the stars are still embedded within the cloud, the remaining pair can even merge together into a single star, making the final system a true binary. Reipurth described the cloud as "a little bit like walking in mud." "You feel a resistance," he said. The drag can cause the pair to spiral together and eventually merge. According to Reipurth, this would describe many of the systems in which only one star is found at the center. "This kind of evolution can only happen when you're inside a dense cloud core," he said. "It will not happen after the binary has blown away its gas and dust." The research was published online today (Dec. 5) in the journal Nature. Wide binaries, where two stars are gravitationally bound but orbit each other from far away, have long provided a puzzle for astronomers. The vast space between these stars means they could not have formed at such distances within the same cloud core. Scientists have theorized that wide binary systems could result when one star in a cluster captures another, an event that would require them to drift in the same direction at the same time. This scenario allows the stars to form close together, within the same system, a more likely turn of events. The third star is key to the ejection, Reipurth explained. "It's a fact of nature that, if you have two bodies alone, then they move in a completely deterministic way — it's possible to say exactly where they will be later on in their orbits," he said. "As soon as you put a third body in there, the system becomes completely chaotic." Two bodies together will simply orbit one another, if not otherwise interrupted. But the third body creates a "kick" that eventually results in the ejection of one of the stars to a distant orbit. Over the course of several months, Reipurth and Mikkola ran over 180,000 simulations of triple systems that would evolve into wide binaries. They found that more than ten percent of the triple systems ended up with stars spread thousands or tens of thousands of astronomical units from each other, a number that agrees with observations. "We were surprised to see how well the results agreed with the observations," Mikkola wrote in an email. "Getting the 'right' answer did not require any adjustments of the model."